So I’m going to attempt to do a little series. I don’t know if it is the beginning of the school year coming to a start or my lack of motivation for decorating lately, but when I looked over the posts that I wanted to share in the next month they were all organizing ones. So I thought I would do a series for you on some of my new favorite storage solutions! I will post 4 out of my 5 favorites on my site and then my 5th one I will showcase in my August Newsletter. I know, I’m so tricky! But it’s a goodie so I wanted to make it special along with some other fall favorites that I have been aquiring for your viewing pleasure! Yes, I’m obsessed about organizing. How do you know, you ask? For me it is verified this weekend when we made a trip to Target and everyone in the family got something special: My husband, churned chocoate chip icecream, my son, a matchbox car, my infant, a pacifier, and me — a storage tub. We’re all completely happy. And I thought that girls were the ones that loved shoes? But it is my oldest son who loves to pick out his shoes everyday and if you didn’t know, there are shoes that make you go faster than others. And yesterday I did it. I was the mom who drove back home from school to get the faster shoes in order to avoid the major meltdown my son was about to have. I was not proud but it had to be done. The scariest part was hearing my son in the back of the car on the drive home to get the shoes whispering, faster, faster, hustle…oh boy. Anyways, for this obsession, and his ever mounting stomper stash – it became time to find some solid storage for his shoes. Bonus would be something that he could reach and get to with ease. 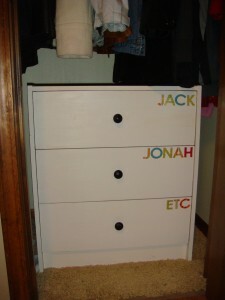 I used a cheap little three drawer dresser that I had from college, stuck it in the coat closet, painted it an off white and added cute little scrapbooking sticker letters that I go in the dollar bins at Target. 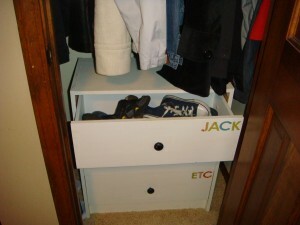 The bottom drawer is labeled, “etc.” that I fill with out of season shoes, gloves, hats, socks, etc. 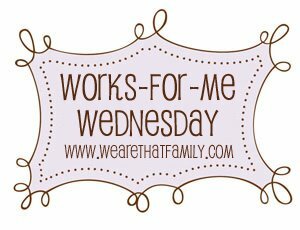 I’m adding this to Kristen’s We are THAT Family Works for Me Wednesday link party where you can find solutions to almost anything! We have shoes galore, and they usually end up in a pile at the front door. Thanks for the idea and for stopping by the blog! Love, love, love this, Katie!! We have one of those shoe stackers in the closet and a basket in the garage, but I still find that we need more space. You’ve solved our problem for us, and it’s super cute, too! I love your series! I’m always up for a good theme, especially when decorating/organizing! Great, as always!